Bruce Wood died of a massive heart attack on November 10, 2009. Bruce was born on September 21, 1947. He is survived by his brother Steven Wood and two sisters, Phyllis and Laura. Bruce was a valuable member of ERB fandom -- an honest, down-to-earth person whose sudden death sent shockwaves through the entire ERB community. Most of us were not aware of his recurring illness that he said originated in SE Asia when he was in the service. It recurred several times a year, a malaria-like malady which gave him bouts of nausea for days. This was probably a factor leading to his early demise. Bruce or "Abner Perry" touched many people through his Internet presence as well as during the many ERB conventions -- Dum-Dums and ECOFs -- which he attended over the years. Bruce was an excellent conversationalist and displayed a wide-ranging knowledge which made him a very popular figure. His interest in ERB collecting and fandom dated back almost 50 years. He shared some of the memories of this life-long passion with us in the ERBzine feature: ERB Fans on the Web, which I've reprinted further down this page. 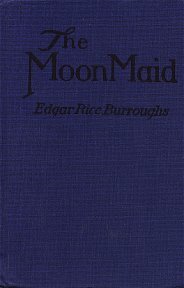 I was honoured to receive his special edition of The Moon Maid a few years back. This rare book exemplifies so many of his talents: bookbinding, bibliographic knowledge, collating and computer skills. Another of his skills was the creation of repro dust jackets, which he lovingly and meticulously constructed. Most have been featured at ERBzine over the years. Many ERB collections around the world have been enhanced with this handiwork, as well as from his talents in book repair. Another of his major interests and skills was cartography. "Abner" had designed ERB-related maps for fanzines going back to the '60s. In recent years he put this knowledge to good use in the creation of his online ERB Atlas. Unfortunately this Website went black following Bruce's death. Luckily Bruce had sent me a back-up disc of the project and I've been able to reformat and upload most of the maps from that defunct site in this tribute. Bruce's passing has been a great loss -- he will be sadly missed. Limited Collectors Edition of 50 Copies in conjunction with ECOF 2000 Clarksville Tennessee ~ Introduction by Bob Zeuschner, Text Comparison by J.G. Huckenpohler, Glossary by Duane Adams and George McWhorter, Ending Commentary by Tracy Griffin, Printing/Sewing/Binding by Bruce Wood, Text Scanning and Formatting by David Bruce Bozarth, Dust Wrapper Design and Manufacturing by Phil Normand, General Coordination by Jim Thompson ~ Publisher and Driving force behind this project: BRUCE WOOD. 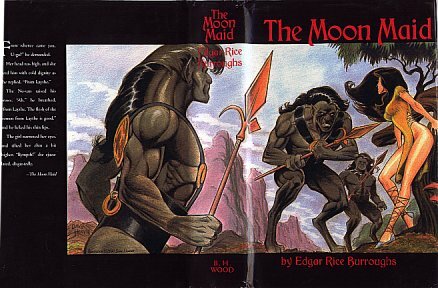 ERB Fans On The Web: ERBzine 0017 Bruce Wood ~ (Abner Perry): The first exposure I had to Edgar Rice Burroughs came at the age of 6 when my antique-collecting father brought home a first edition of Tarzan and the Jewels of Opar. I was too young to read the book, but my cousin read it to me. By the time I was 11 I had mastered reading skills well enough to read it for myself. This I did - many times. By the time I was 13 the book was falling apart from constant re-reading. When ACE Books published At the Earth's Core in 1962 I was already haunting the local news stands searching for science fiction. I discovered the book immediately, and recognizing the authors' name, I decided to give it a try. At The Earth's Core was soon followed by The Moon Maid and then Pellucidar and The Moon Men. I was hooked. From that point on I acquired and read everything I could find by Edgar Rice Burroughs. But after five years of collecting, my uncle called and I spent 26 months in Southeast Asia, effectively putting a hold on these activities. What with the real-life adventure I was living at the time and a marriage almost immediately after the war, I was absent from the hobby for about 10 years. 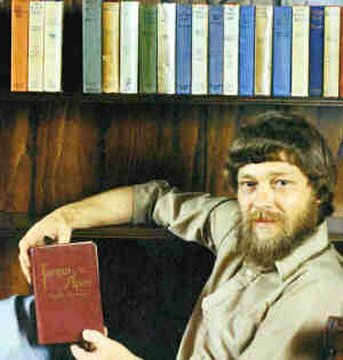 In the late 1970s I came back only to discover that my favorite source had dried up - Caz was no longer active, having sold his own stuff about 1978 and given up publishing ERBdom. I began to search the rare book stores. Ouch! Things were hard to find and when they did show up the price was outrageous! Imagine $20-$25 for a G?D in jacket. Well, I bit the bullet and paid the price. After all, I was single again and working as an electrical design engineer for General Motors, so I could afford the books even if I didn't like the price. However progress was slow since the books were scarce even with funds now available for their purchase. Then my big break came. One of the book stores offered to go into a partnership with me to purchase an entire collection from a collector who was liquidating. I was to have first choice of the 40 year collection. When the dust cleared my collection was as complete as I thought it would ever become. By this time the McClurg editions in jacket were selling for $600 to $800 a pop, except Tarzan of the Apes which had reached a price over $2000, and I had decided there was nothing else to buy as long as I considered myself sane. I continued reading the books, mostly the paperback editions. Nearly every title was now available in paper and it was almost criminal to even handle my jacketed firsts, let alone actually read them. So my collection just sat on the bookshelf, taking up space, not being read, and constantly reminding me that I might as well be looking at a $10,000 bill sitting there. In 1988 the fatal thought struck - why not sell off the books, not one of which had been even opened for 5 or 6 years. And so I committed what I now consider the greatest blunder of my 52 years and sold out. More than any single event of my life, not even excluding the ill-fated marriage of the '70s, I wish I had that decision to make over again. But wish in one hand, as they say, and spit in the other and see which fills first. Now I am collecting again. This time I am restricting myself to the reprint editions. I am shooting for reprints in jacket but firsts are out of the question. At current prices 5 or 6 McClurg jackets would cost me more than I got for my entire collection in 1988. And that brings you up to date on my collecting activities, except... I now also collect classic Studebakers and have migrated into book binding. And now, computer systems coupled with the internet, make it possible for me to bring to fruition something I've planned and worked on for many years: an Atlas of Edgar Rice Burroughs. The story of how much of this evolved over the years,and the copies of the maps themselves, are featured in my ERBAtlas Website. My name is Bruce Wood. The first exposure I had to Edgar Rice Burroughs came at the age of 6 when my antique-collecting father brought home a first edition of Tarzan and the Jewels of Opar. I was too young to read the book, but my cousin read it to me. By the time I was 11 I had mastered reading skills well enough to read it for myself. This I did - many times. By the time I was 13 the book was falling apart from constant re-reading. But after 5 years of collecting, my uncle called and I spent 26 months in Southeast Asia, effectively putting a hold on these activities. What with the real-life adventure I was living at the time and a marriage almost immediately after the war, I was absent from the hobby for about 10 years. In the late 1970's I came back only to discover that my favorite source had dried up - Caz was no longer active, having sold his own stuff about 1978 and given up publishing ERBdom. I began to search the rare book stores. This is me circa 1985 holding my first edition of Tarzan of the Apes. It is the printing with no acorn on the spine. My collection at this time included every first edition. Of these, all books had a jacket excepting the McClurg editions. I did have five McClurg titles in jacket, but mostly the McClurg editions were backed up by a G?D in jacket. Therefore I had a copy of all jackets. By this time the Mcclurg editions in jacket were selling for $600 to $800 a pop, except "Tarzan of the Apes" which had reached a price over $2000, and I had decided there was nothing else to buy as long as I considered myself sane. I continued reading the books, mostly the paperback editions. Nearly every title was now available in paper and it was almost criminal to even handle my jacketed firsts, let alone actually read them. So my collection just sat on the bookshelf, taking up space, not being read, and constantly reminding me that I might as well be looking at a $10,000 bill sitting there. In 1988 the fatal thought struck - why not sell off the books, not one of which had been even opened for 5 or 6 years. And so I committed what I now consider the greatest blunder of my 52 years and sold out. More than any single event of my life, not even excluding the ill-fated marriage of the 70's, I wish I had that decision to make over again. But wish in one hand, as they say, and spit in the other and see which fills first. Employing the methods of Burroughs himself in Jungle Tales of Tarzan, I will take you back again to the 1963-64 era. In the mid 1960's I became much interested in the Pellucidar map and started adding to it by reading the books carefully and trying to determine the locations of different areas from text references. It was about this time I discovered the fanzines - ERBdom from Caz, Erbania from Pete Ogden, The Burroughs Reader from Dale Broadhurst, and the little known Thuria that was distributed by Larry Taylor in Kent, Ohio. Kent soon after became well known because of the unfortunate incident resulting in the student deaths. When I was 15, Larry accepted a rather simple 'Pellucidar Glossary' from me because he was a little hard up for material. I figured that if Larry would publish me maybe I could get an Atlas of maps published. But even then I had big ideas. Larry's fanzine was produced on a spirit duplicator which didn't look as good to me as The Burroughs Reader, which was mimeographed. Of course the photo offset ERBdom was even better, but I wasn't brave enough to try for the big time. Here we are back in 1998. Computer systems coupled with the internet now make it possible for me to take another swing at it, and that is what you will see -- the beginnings of an Atlas of Edgar Rice Burroughs. I will start by placing copies of the maps from Bruce on these pages, and add more maps as I can acquire them. More of Bruce's Handiwork: Dust Jacket Reproductions at ERB C.H.A.S.E.R.